I had to re-seat the thermal tape, but it's otherwise in mint condition.. Not a single speck of anno is missing. As you can see, it also came with an FM-3H head. What you can't see, though, is that bwaites also threw in an Otokoyama PMR reflector. I knew it would obliterate my Surefire U2, but I didn't expect it to be in the same league as my Mag85. Now I know just how lucky I am to own this great light. If the t-storms will cooperate, tonight's gonna be fun! Last edited by Codeman; 07-16-2006 at 05:37 AM. Add me to the Interested list, Please? Who knows what the future holds. A whole box of X-bins could fall from the sky tomorrow and if they do, I'm in!!! Carrying a firearm for self-defense gives you great power. Society expects great responsibility from those with great power. New brethren map updated. It seems like we've lost our last EU MR-X to NY, USA. Welcome Matt! I'm a bit late checking in, but silver Mr X., serial #D2021255717 is present in SE MI. hotbeam, I got if from Skalomax back in Aug of 2007. Hey Dennis, Have you tried the head with a FM 3in Head? Not yet, but that's a good suggestion and worth a try. Thanks Hotbeam! I'm a little late responding, because I just now noticed this thread. It's an honor to be one of the few! There is still one extremely bright, black MR-X in Germany! Last edited by darkzero; 05-09-2008 at 08:51 PM. Sorry, I have retired from flashlight modding & I do not make custom flashlights. Thank you for your understanding. My bad PeterB. Map updated. DZ, very nice build as usual. Looks like another great X light! Mine is still going strong with a 2-D size LI-ion pack with over/under protection circuits. VERY long run time with white/bright light. Perfect light in my opinion. A blue MR-X (serial #D2020902154) has relocated from New York (addictedmatt) to California. Thanks for the update. I am keeping a history now so you can see where the last owner was from. Its been a while since my last post!!! 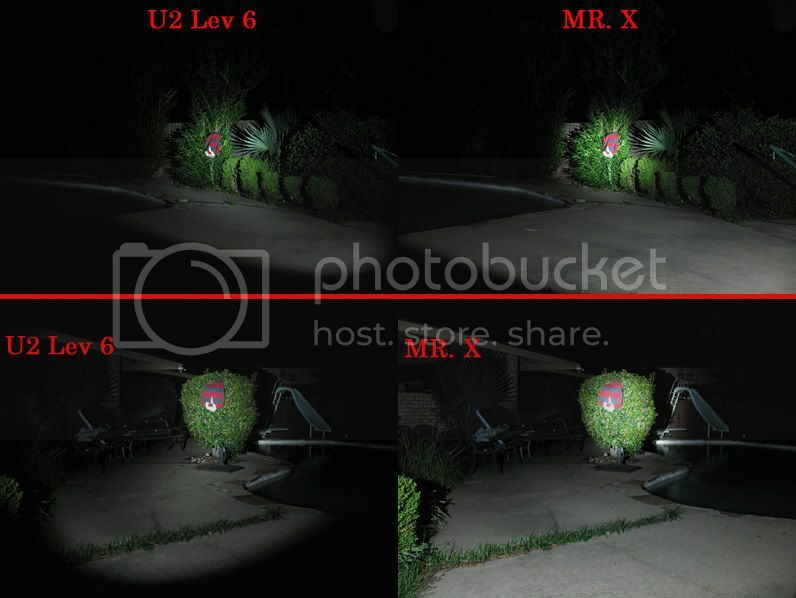 Other than a BTTT (for what reason I don't know ), the MR-X is 5 years old !!!!! Actually it is 5 years 4 months. That is more than a lifetime in LED terms. I haven't followed CPF for a while and surely, there must have been a few contenders (or new titles) for the "crown". What's around? Hope all the MR-X brethrens are doign well All lights still working? Mine is still sitting happily on my shelf. Mine is still working like a champ, though it does spend a lot of time on a shelf. It's top dog in my LED collection, but I haven't really been pursuing many lights recently. Surefire has a couple of LED lights on the way that might challenge the M-X/X3T, but I don't have the model designations handy. OpticsHQ has a signup thread on CPFM that has some specs, though. my old MR-X is somewhere in Europe... hopefully doing well. 5 years... many generation of LED's have passed... also have wondered... what light now hold the title for most output for a single LED light? Ithe MR-X is 5 years old !!!!! Actually it is 5 years 4 months. That is more than a lifetime in LED terms. I haven't followed CPF for a while and surely, there must have been a few contenders (or new titles) for the "crown". What's around? BTT. After hotbeam so kindly worked some MAJOR magic to fix the blown X3T LED in mine (he reattached a tiny blown gold lead wire inside of the LED - so it now has no dome, but works just fine ), it has become the go-to light I keep in one of my vehicles. Even 5+ years later, this is still one HOT LED light! BTW, my red-headed step child MR-X is with me in CO now (I moved from TX almost 2 years ago). "The problem with engineers is that they don't idle well." "A man without fear is a man without hope." WooHoo!!! That's not the sun lighting things up, it's my homemade flashlight!!! Have you thought about upgrading the X3T with a CREE MC-E (M-bin) wired 2S2P? You would get an overwhelming amount more output, but the spirit behind the light would still be the same. The thought had occurred to me. The problem is that I want to upgrade too many lights to MC-E right now (LionHeart, old L4, McGiz PR). That can get costly REALLY quick! I do LOVE the flexibility of the MC-E wrt wiring.